Ritual Baths Deceptions is the fourth story of Spiritual Embarrassments, Collection of five short stories edited by Tâ-Shalom Editions, The books to liberty. Distressed because of his unrewarded struggles to get a job, Koffi looks for solutions. Washing away misfortune and purifying his aura seems the best way to success and each of his helpers will suggest one after another a bath ritual. From promises to disillusions, Koffi finds himself into witchcraft at the end and does not know where to find help. Will he survive? What is it all about in this book? In the Muslim, Hindu, and African traditions, a ritual bath is a process of washing the body according to rites that have spiritual implications. The ritual bath thus accomplished carries with it the promise of success, joys, happiness, and peace in the future of the person being washed. However, the undersides of such bath are appalling. If profits are always put forward, it goes without saying that the consequences of the ritual, even if unknown, exist and will manifest themselves in time. For, many rituals are nothing else but signatures of spiritual compacts cleverly veiled to the seeker of better life. In other words, the only ritual bath doesn’t bring good fortune, but an invisible entity for which rituals are performed. Therefore, it is found in most cases that the spiritual washing that takes place in a river, on a Beach, behind a hut or even in a bathroom is the calling of a third party, a spirit, for help to reach glory. But for those who understand demons, such help will always be accompanied with setback and hardship that will arouse anger, resentment, and fear. 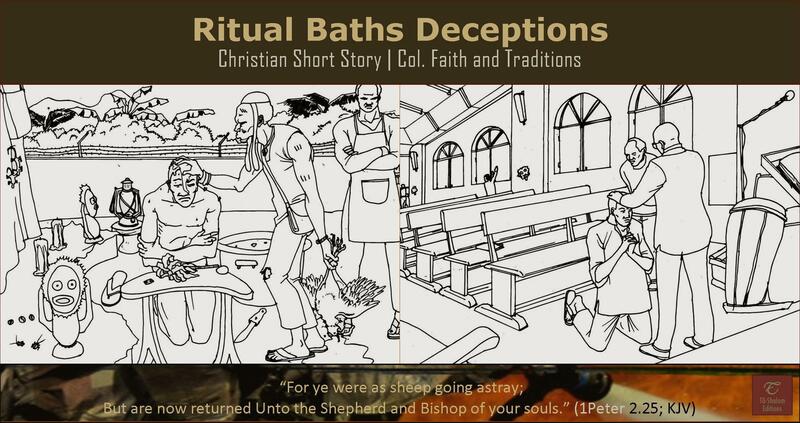 Ritual Baths Deceptions depicts the tragic story of Koffi who, after several baths, is announced the hidden face behind the sacrifices he himself had agreed to. Will he curse his ignorance of spiritual things? Will he curse the servants of the spiritual world who did not tell him everything beforehand? He had to know! He had to understand the codes! He had to know… But as for now, what will he do? This story prompts the reader to become aware of the spiritual realities that are scary for the ignorant. The invisible world is predatory and anyone seeking spiritual help far from Jesus Christ is likely to fall into the traps of ruthless demons. Where to read, buy or download this book? The short story is available in French under the title: L’Illusion des Bains Rituels.